Haneen Zoabi has survived insults, death threats, and the vagaries of the Israeli justice system. But the first Palestinian woman to represent an Arab party in Israel’s Knesset wants something more — to be heard. Over the course of a decade as an elected official, Zoabi, forty-nine, has regularly faced death threats. On and off, she’s had to be assigned a government bodyguard. A few years ago, ex-Knesset member Danny Danon, now Israel’s representative to the UN, referred charges of “incitement to violence and terrorism” against her to the Israeli High Court. “I ask the court to help open the eyes of law enforcement,” he wrote in his official petition, “and send Zoabi to the place she really belongs: prison.” Her “murderer” comments got her a suspension of one week. A pittance compared to her record six-month stint. A few months after that bit of controversy, on a late morning in late summer, I take a rental car and head to Nazareth, with my father Yoav, to meet Zoabi. Passing through Nazareth Illit, a planned Jewish town, we drive past construction cranes puttering near rising three- and four-floor apartment buildings. The attempt to “Judaize” the land adjacent to the historical Arab city began in the late fifties, my father points out. Clearly it is still ongoing. Zoabi greets us in her driveway. Refusing to let him wait in the car, she hustles my father into a side office full of dark wood and framed law degrees, then, to his visible delight, brings in a silver tray covered with baklava and delicate floral-decorated coffee cups. Zoabi and I move into the living room, an airy space with good natural light, a hard tile floor, a big grandfather clock, and a StairMaster. From afar, I’d been curious about Zoabi for years. She acts as if she is fearless. She’s loathed as if she is feared. Is she merely a loud, marginalized voice in the din of Israeli politics, or something more potent? And what role does an elected radical have, anyway? What can they accomplish? I mention Zoabi’s “drama” in the Knesset, and she jumps in at a gallop. For the next fifteen minutes, she practically delivers a monologue — or perhaps a stump speech. As she speaks, her excitement nearly totters her over the edge of her seat. Suddenly, she cuts herself off. “Coffee!” she says, with a raised index finger. She runs off to the office, pours Yoav a cup, and then returns to seamlessly finish her point. 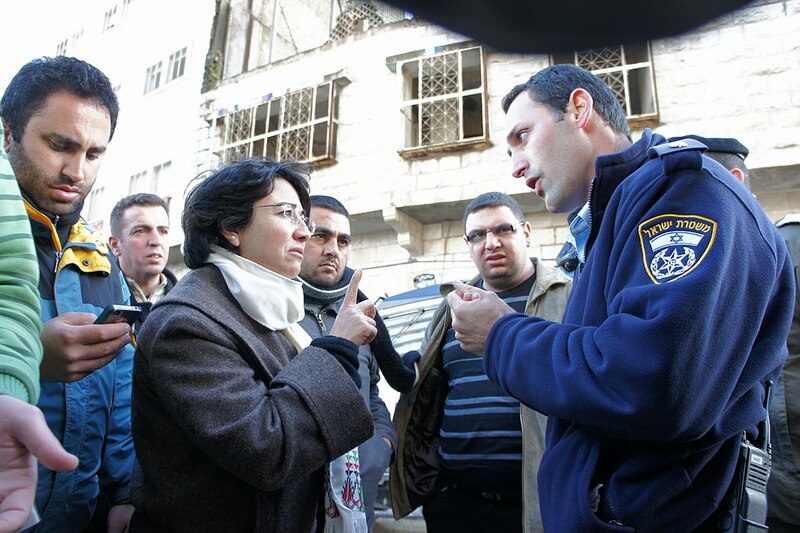 In her teenage years, Zoabi aspired to a career in journalism; after a Master’s in communications at Hebrew University, she worked as a schoolteacher, then co-founded an Arab media NGO. When she joined the political office of the Arab party Balad in 1998, she discovered a calling charting policy. Eventually, without necessarily intending to, she became a candidate herself. In its first fifty years, only two Arab women had ever been elected to the Knesset. Both represented Jewish parties. In 2008, Balad put Zoabi on its candidate roster. When she won, she became the first Arab woman to actually represent an Arab party. During her first year, she was a little-known Knesset member with a focus on gender equality. Then came the 2010 Gaza flotilla. Organized by Turkish activists, the flotilla was a humanitarian effort to break Israel’s blockade on the Gaza Strip. Six ships, packed with school supplies and generators, were boarded in international waters of the Mediterranean Sea and headed to Gaza. A few days in, Israeli commandos landed on the largest ship in the flotilla, the Mavi Marmara, via ropes hanging off helicopters. In the ensuing confrontation, ten activists were killed. A UN human rights report stated that Israel “betrayed an unacceptable level of brutality” in the flotilla raid. Israel’s own inquiry acknowledged “the regrettable consequences of the loss of human life and physical injuries” but claimed Israel had acted according to the norms of international law. The incident further radicalized Zoabi. It also made her famous — or infamous. In the aftermath of the flotilla affair, Zoabi became a fixture on nightly news and radio call-in shows. She proved adept at parrying hostile or bemused Israeli journalists. And she was uninterested in temperance in the name of “civil discourse.” She was also an elected Knesset member, and therefore difficult to dismiss completely as a fringe voice. She became the insider Arab radical. In the Knesset, the debate that ensued in the immediate aftermath of the flotilla devolved into chaos. As Zoabi spoke from the lectern, the body erupted in protest. One member shouted, “We have to vomit her out of the Knesset!” Others confronted her physically, getting in her face to shout invectives. Through the din, Knesset Speaker Reuven Rivlin begged — to no effect — “Let her speak! The power of democracy is in our ability to listen!” Over the years, Zoabi and her right-wing opponents have continued to stage similarly remarkable scenes. Every few years, it seems, she manages to unleash utter mania in the Knesset. Mhajne has other critiques. She doubts whether Zoabi’s attempt to speak to an international audience through the college lecture circuit ever reached beyond an existing pro-Palestinian echo chamber. And she’s skeptical of the wisdom of Zoabi’s tacit approval of Hamas tactics over the years. But she recognizes Zoabi’s effectiveness. “I think the various attempts to discredit Haneen is proof that having outspoken Arabs in the Knesset is a threat to the Right.” She believes Zoabi did wield power; that there is a kind of power in her words. When I meet with Zoabi, the March of Return is roiling the region. Every Friday for months, protestors in Gaza had massed at the Israeli border, demanding to be granted return to the lands from which their families had been expelled. Some burned tires and threw rocks; some waved flags. Israel dismissed the protests as calculated provocation by Hamas. Israeli snipers stationed on the border fired live ammunition. By the summer, there were more than 150 deaths and over 15,000 injuries. When out in Jerusalem, she almost never enters restaurants or coffee shops without friends. And there are certain parts of the city that she avoids altogether. When shopping at supermarkets, she sometimes hears fellow customers screaming at the cashier. Things like, “Don’t serve her! She dares to come, the terrorist!” When the current Speaker of the Knesset got married a few years back, nearly every member other than Zoabi got an invitation. In the summer of 2016, the Knesset passed an impeachment law. Previously, Knesset members could only be removed if they had been convicted of criminal acts that involved “moral turpitude.” The new law created an avenue to eject Knesset members for “incitement of racism” or “support for terror.” Colloquially, it was referred to as the Zoabi Law. But in the end her political opponents never managed to use it to boot her. I make the mistake of asking Zoabi if she sees any reasons to have “hope.” I didn’t mean to use so soft a word. She looks at me sideways. Over the last decade, she says, “the right wing redefined political norms. You” — as in, Israel — “moved from racist to semi-fascist, not because of the occupation but because you don’t pay the price. Whatever you do. Whatever you do to the Palestinians, you do not violate international law. Whatever you do, you are ethical. There are no connections between reasons and results. No rationality. We go back to the side office and sit with my father for a bit. He grew up here, served in the IDF here, had his kids here. But he moved us out of the country in the early nineties. Now, the two chat amiably about the changes the country has seen. The particulars of their experiences are radically different, but they’re both angry and discouraged and engaged. So they have lots to kick around. They sit, talking shop. I thank Zoabi for her hospitality. For the baklava. In early 2019, Zoabi indeed announced she would not run for reelection in the April 9 elections. As much as anything, it was a pragmatic decision. When her term is up, Zoabi will rejoin the political office of Balad. It’s a calculated retreat with a few notable wins. Following her announcement, the former defense minister Avigdor Lieberman tweeted, “Good that the senior representative of the fifth column is leaving the Knesset. I wish her luck in Gaza or Beirut.” Lieberman was one of Zoabi’s most virulent critics. All of that virulence, though, never curtailed Zoabi’s presence. She left on her own time. Then, in the run-up to the election, Balad was one of a handful of parties disqualified by a decision of the Central Elections Committee. In response, Balad put out a statement in the punchy style of classic Zoabi, saying that its disqualification had been pushed “by a gang of racist toughs in a political atmosphere in which racism is threatened by democracy instead of the other way around.” Then Balad fought, successfully, to have the disqualification overruled by the Israeli High Court. Eventually the conversation, again, shifted down into a lower gear. Of her future after the Knesset, she promised me not much will change. Out of office she’ll work just as hard, just as long, towards the same ends. Amos Barshad is the author of No One Man Should Have All That Power: How Rasputins Manipulate The World . He lives in London.